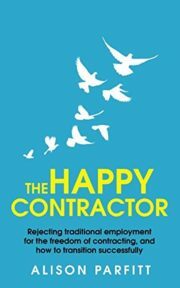 The Happy Contractor, 2nd Edition: Rejecting traditional employment for the freedom of contracting, and how to transition successfully. Are you fed up with the control your employer has over you and your life? Does it feel like you’re chained to the daily grind, inflexible working practices or lack of variety in your job? Do you wish you had more autonomy over your work-life balance, the work you do and its financial rewards? More people than ever before are rejecting the constraints of traditional employment in favour of working independently as a self-employed Contractor, Consultant or Freelancer and in 2018 this trend is set to continue. The demographics of Contractors are changing: a growing number of women and younger workers are becoming Contractors, and decades of experience is not necessary to find work. Nevertheless, many people aspire to work this way but are unsure how to make it happen, and worry about the risks. At thirty the author successfully transitioned from permanent employment to contracting. Now in her mid-thirties, she represents the changing face of the contracting market. If you are considering moving away from traditional employment towards contracting, this little book sets out for you in clear and concise terms what you need to know. Up to date for 2018, it will help you to: – understand how much work is out there for you and find work. – successfully transition from permanent employment to contractor. – set yourself up as a contractor (with a simple checklist). – decide whether to trade as a limited company, via an umbrella company or as a sole trader and the differences between each one. – get to grips with how your money is extracted from a limited company should you choose to trade this way. – pick a good umbrella company should you choose to trade this way. – succeed at contractor interviews and adapt your CV for contract positions. – decide how much to charge clients. – understand IR35 legislation (including the ‘off-payroll’ changes of 2017) and how to protect yourself against falling foul of it, in simple terms. – understand the risks of being a contractor and how to mitigate them. – understand the role of your accountant, and when to employ one. – understand when you need to purchase Professional Indemnity insurance. And so you can be sure that contracting is the right decision for you, this book also gives you an honest account of: – the benefits of being a contractor. – what life is like as a contractor. – how you might be treated differently as a contractor. – behaviours which make for happy clients. – behaviours which are unproductive. There are also links to other useful resources. If you’re considering a career in contracting, or simply want to find out more about it in an easy-to-digest format, download a sample or buy now.